How do I buy a Burgerim Franchise? 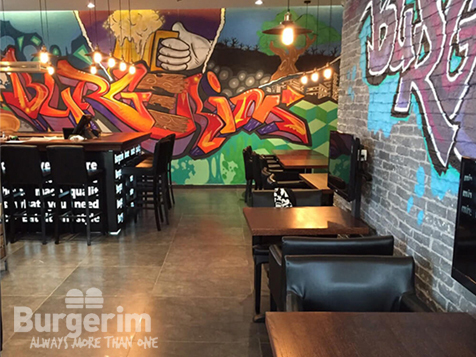 Set a Standard of Excellence as a Burgerim Franchise Owner. Burgerim's expertise and experience accumulated over the past number of years is what has led to their winning business formula. Burgerim's successful business concept has a precise and distinct method and system in place which ensures that every franchisee can optimize the management of their restaurant, even if they do not have experience in the food industry. Learn more today how you can become part of this global effort. Open Burgerim in any of these available states: CA, CO, NY. At “Burgerim” you get 8 ounces (240g) of prime freshly ground meat divided in to three mini burgers which are easy to hold and can be customized to suit different tastes. 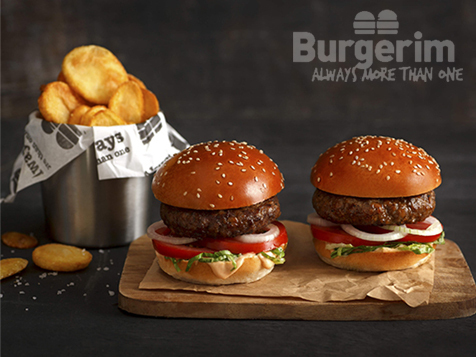 Each individual burger stands out declaring its individuality with a statement of its own special flavor and design, choose from Merguez (spicy) topped with sauté mushrooms or smoked beef topped with fried onions – the choice is yours. Our various flavors and toppings are here to satisfy your desires. If your preference is to watch your waistline, or if you are not a meat lover, we have a wide range of alternatives for you, including a variety of salads, vegetarian burgers and several other low calorie options. What we strive for is a fresh, delicious and enjoyable dining experience for every “Burgerim” Customer. Most importantly, we believe we have created the most logical business opportunity for those aspiring to find a franchise concept which makes great business sense. In 2011, after the unmatched success and popularity of the first Burgerim restaurant, we began to sell franchise stores to prospective entrepreneurs. Within a period of less than 2 years, the chain expanded at an explosive rate to over 80 franchised restaurants. In 2015 we began to pursue our International expansion goals, with stores operating or in the process of being opened in Russia, Romania, Spain and soon in the UK and USA. The interest in the Burgerim Chain and its Business strategy is growing rapidly across the globe. Honesty and Integrity - We believe in behaving honestly and with integrity in all interactions and dealings. Consistency – We will provide our customers with a popular selection of burger flavors and combinations that use high quality ingredients. Service Excellence – We are committed to providing the highest level of world class customer service and to achieving excellence every day. Team Work – We work together as a team to ensure we achieve our goals and joint success. We maintain an active website which provides our customers with an online ordering service and the option of having the meal delivered to them. Our expertise and experience accumulated over the past number of years is what has led to our winning business formula. Burgerim's successful business concept has a precise and distinct method and system in place which ensures that every franchisee can optimize the management of his restaurant, even if he has no experience in the food industry. An innovative concept in the burger business. Small to medium sized restaurants with a big impact. This allows for a lower build out budget and an easier start up investment. Smaller sized restaurants also allow for a more effective multi-tasking staff compliment, which results in lower labor costs compared to other similar burger chains. A “State of the Art” design and low cost construction building package. R&D - the chain is constantly reviewing, renewing and developing new menu products. Suppliers and low food costs - the chain’s substantial buying power results in lower food cost prices compared to market prices, without compromising the quality of the menu ingredients. This results in every franchisee enjoying a competitive edge in his retail pricing. Most of our products reach our franchisees pre-prepared and are delivered in such a way that the franchisee does not have to hire chefs and experienced kitchen staff. This methodology therefore dramatically reduces the cost of highly skilled kitchen labor. Our stability and strong foundation is supported by our highly talented and experienced operations team. Our combined experience is in excess of 30 years, which means that our franchise support is not only based on our impressive academic studies in management and marketing, but also from years of “hands on” experience. This allows us to share our “best practices” and “know how” with our current and future franchisees. Research and Development: We have a strong R&D department which continuously monitors market trends and customer needs and wants. Based on their findings they then innovate, improve and introduce new products suited to the market. Customer service training: We understand that our customers not only expect good quality and tasty food, but also fantastic service and a pleasant and clean environment. We therefore invest in whatever training resources necessary to ensure that our franchisees strive towards excelling in these three critical elements of the business. Business Training: We understand that not everyone has experience in running their own restaurant business and that this is part of the reason that franchisees join our family. To overcome this, we do our best towards educating our franchisees on how to run effective and profitable businesses – from correct and efficient recruiting, staff training, food cost control, marketing, and above all, on treating every Burgerim customer like they are royalty. Franchise advertising fund: Even though our large presence is always felt in the retail market place, our “Burgerim” family of franchisees continually invests substantial funds into advertising and marketing which is used for executing major advertising campaigns, using various types of media such as television, radio, highway media, sponsorships, digital, and print platforms. Once entering into a franchise agreement, we will guide you through the full business establishment process, from assisting you to find the right location, to the setting up of the business, and finally in assisting you with the opening of your branch. When the store is up and running, you will benefit from our continued support program, which includes ongoing operational support, training, marketing and more. We will support and assist you in choosing the right location. We will provide you with architectural support and guidelines for your building process. We will make recommendations regarding the purchase of your equipment and furnishings. We will provide you with a complete business training program for you and your staff. We will provide you with a detailed operations manual which will be used as a continued source of information on how to run your business efficiently. We will assist you with setting up accounts with our approved food suppliers. You will benefit from our cutting edge branding and advertising campaigns. We will assist you with your local marketing. You will benefit from our ongoing franchise support. Join the successful Burgerim chain and become a restaurant owner today. Burgerim is not currently active in our directory, but here are some other recommended selections for you to explore.